Sanford Honda in NC has the perfect fit for those of us in the market for a versatile vehicle. The 2016Honda Fit is a little car offering big accommodation. This handy hatchback from your local Honda dealership is built to fit more than its outward appearances lead you to believe — meaning you can do more than you might imagine, too. Boasting a cavernous 52.7 cubic feet of cargo space and four different interior configurations, a 2016 Honda Fit is designed to haul it all, from team equipment for baseball practice to lumber for deck repairs or that handsome houseplant you just scored. And, the newest Fit is not only the most cargo-capable vehicle this side of much larger SUVs and family vans … it also comes in fun colors from the light and bright Mystic Yellow Pearl to the vivid Milano Red or the subtle purple tones of the Passion Berry Pearl paint. Maybe you have more people than cargo to carry. No sweat, because the 2016 Fit from your local Honda dealership in Sanford, NC, has a People/Refresh Mode (to go along with its Utility Mode, Long Mode and Tall mode) that can handle up to five people and still give everyone space to stretch out with nearly 40 cubic inches of legroom in the rear. Consider the Fit’s 95-plus cubic-feet of total passenger volume, and you’ve got a compact car that rivals family sedans for space. 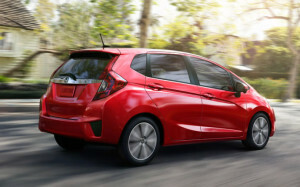 So exactly how does the Honda Fit manage it all? Magic. A Second-Row Magic Seat, that is. This “magic” seat can accommodate anything from people and pets to home improvement materials to plants and much more. Fold the rear seat down, and you’ll have a large, flat area for a multitude of things. Additionally, the large opening on this hatchback coupled with a low floor make loading and unloading a breeze. With the rear seat and the passenger seat folded down, this versatile vehicle can carry items that are up to 7 feet-9-inches long. Fold the rear seat flat and then flip it up to create a deeper cargo space for those taller items that are up to four feet high. This is perfect for carrying home lamps, houseplants and other tall items. So what are you waiting for? Visit Sanford Honda in NC today and test drive the 2016 Honda Fit. Come see for yourself how amazingly accommodating the 2016 Honda Fit can be for you and your crew.